Yesterday I was talking to a friend who works in the addictions field. She told me about a book to help people stop smoking. In my view, smoking is one of the hardest addictions to quit. I quit smoking cigarettes about 20 years ago and I know how important positive thinking and a good support-network can be to help quit! 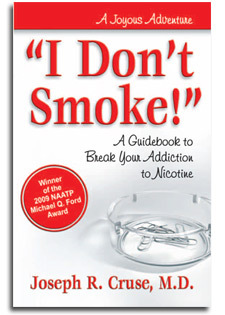 This new book, “I Don’t Smoke” looks like an excellent tool for those either looking to quit smoking cigarettes or for those with loved ones they want to help quit smoking. What I like about the approach is that it centers on the addiction, not the substance. Our brains pleasure centers get addicted and it’s the pleasure centers in our brains that we need to work with to stop the addiction. Hammering home the future potential hazards of smoking (lung cancer, emphysema, heart attack), don’t help smokers quit. A fear based approach makes smokers want to avoid the informer…and go have a cigarette to deal with the anxiety of hearing about potential future health issues. Receiving help and helping others remain free from an addiction to nicotine. To order the book (for the 2011 price of a pack of cigarettes, about $11), click here. Who is the Author of I Don’t Smoke and Why Should We Listen to Him? 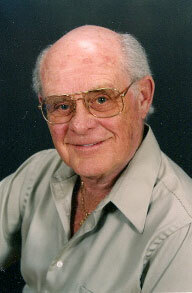 Joseph R. Cruse, M.D, wrote the book I Don’t Smoke. Dr. Cruse is an oncologist-surgeon, an addiction medicine specialist, author, and lecturer. He is the Founding Medical Director of The Betty Ford Center at Eisenhower Medical Center. He served as President of the Medical Staff at Eisenhower. He served 8 yrs. on the Governor’s state alcoholism advisory board for the State of California and 12 years on the California Medical Association’s Impaired Physicians Help Committee. He was Medical Director of Onsite Workshops for 12 years. He has served as consultant to industry, school systems, hospitals, and universities. He has been a guest on “60 Minutes”, “Good Morning America” and the “Late Night Show”. He has been featured in magazines in the U.S- and Australia. I am trying to contact Dr. Cruse. I just tried an old email address I had for him (4 yrs. ago) when we communicated before but I am currently trying all approaches. I hope this or some other means reaches him. If you could help me reach him, I would appreciate it. My phone is (925) 787-4608 Dr. Cruse and my father Chuck Allen knew each other.